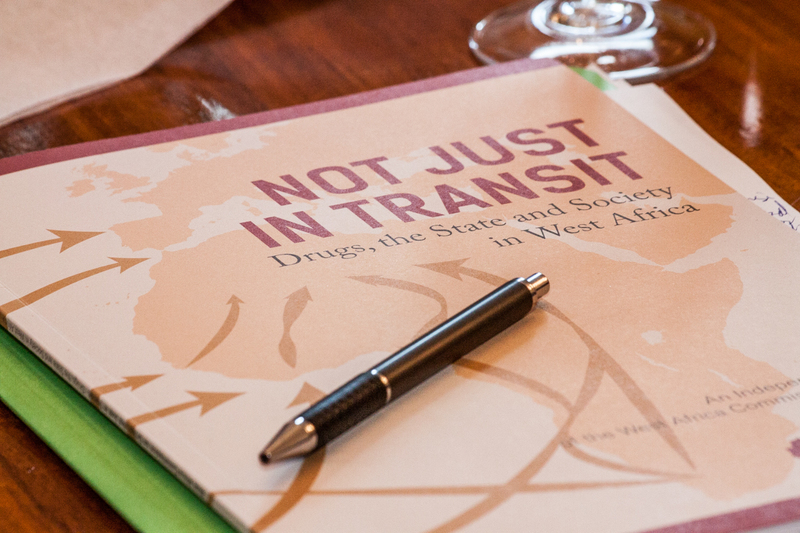 The West Africa Commission on Drugs was convened by the Kofi Annan Foundation in 2013 to help counter the threat posed by the illegal drugs trade. Two Commissioners of the West Africa Commission on Drugs, Dr. Mary Chinery-Hesse (Ghana) and Mr. Adeolu Ogunrombi (Nigeria), visited Liberia from February 29th to March 4th. They paid a courtesy call on President Ellen Johnson-Sirleaf during which they briefed her on key findings and recommendations of the Commission’s report entitled Not Just in Transit: Drugs, the State, and Society in West Africa. President Ellen Johnson-Sirleaf said many Liberian youth are unemployed and uneducated as a result of the long-drawn war and tend to be vulnerable to the schemes of drug barons. Some are also drawn into drugs as a way of alleviating their pain and raising money to take care of their families. The people who should therefore be targeted for punishment are drug traffickers and not necessarily drug users who, in many instances, are just victims of circumstances beyond their control. She encouraged the WACD delegation to engage with the young and those who use drugs for first-hand information about their concerns. During discussions with the Ministries of Justice, Health, Internal Affairs and Foreign Affairs, the Drug Enforcement Agency and the Police as well as Civil Society Organizations’, Dr. Chinery-Hesse and Mr. Ogunrombi noted that even though drugshave destroyed many lives, current policies have not helped either. The punitive methods used to contain the drug menace have led to unintended consequences: a huge black market has emerged and isfuelling corruption in the sub-region; domestic drug consumption is on the rise; many young people find themselves in prison and come out more hardened than they went in; there are established cases of HIV infections as a result of injection drug practices. The Commissioners observed that drug users who need help are driven underground because of stigmatisation and criminalisation of drug use. They drew attention to the obvious need for reform and called on the government to invest in evidence-based prevention programmes, harm-reduction, treatment and rehabilitation of drug users. The West Africa Commission on Drugs strongly recommends that Liberia’s drug control response move beyond just enforcing the law or focusing on repression; it is important to consider the drug problem as a public health issue and prioritise it within the country’s broader development agenda. Deeply concerned by the growing threat of drug trafficking and consumption in West Africa, Kofi Annan, Chair of the Kofi Annan Foundation and former Secretary-General of the United Nations, convened the West Africa Commission on Drugs (WACD) in January 2013. The Commission’s objectives are to mobilize public awareness and political commitment to the challenges posed by drug trafficking; develop evidence-based policy recommendations, and promote regional and local capacity and ownership to manage these challenges. Chaired by former President Olusegun Obasanjo of Nigeria, the Commission comprises a diverse group of West Africans from the worlds of politics, civil society, health, security and the judiciary. The Commission is an independent body and can, therefore, speak with impartiality and directness. Its report is the culmination of one and a half years of engagement by the Commission with national, regional and international parties including the African Union (AU), the Economic Community of West African States (ECOWAS) and the United Nations Office on Drugs and Crime (UNODC). It is informed by a series of background papers, drafted by leading experts from Africa and beyond.